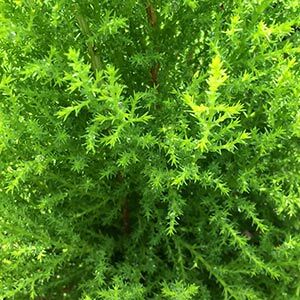 Fast growing and widely used as a hedging plant Cupressus macrocarpa is commonly known as the ‘Monterey Cypress’ . With its easy to prune nature and dense growth habit it has widely beed used as a formal hedging plant for many years. It is the cultivars that are most widely used in landscaping. The main features are the attractive foliage and easy care nature of these small to medium sized landscaping trees..
C. macrocarpa ‘Lambertiana’ – With a more spreading habit and is used as a windbreak on rural properties. C. macrocarpa ‘Brunniana Aurea’ – Has a more golden green foliage and is again suited as a windbreak rather than a formal hedge. Reaches a height of around 8m with a spread of 4m. C. macrocarpa ‘Greenstead Magnificent’ – Has a horizontal spreading habit. C. macrocarpa ‘Gold Pillar’ – This is a more upright form as the name suggests. Good yellow to green foliage and reaching a height of 2 – 3m this makes an excellent small screening tree for smaller gardens. C. macrocarpa ‘Wilma’ – Also known as the Lemon scented Conifer. Excellent small growing conical tree to around 3m in height. The fragrance of the foliage is attractive and this is a variety that lends itself to growing in containers. Foliage colour will differ depending on the amount of sun. Cupressus macrocarpa are widely used as hedging plants and windbreaks although some forms are well suited for us as ornamental trees. Cupressus macrocarpa or ‘Monterey Cypress’ has been a favourite hedging plant for many years and is easily clipped to create a formal effect.